Looking for the inside scoop for the Stevens Point Area? 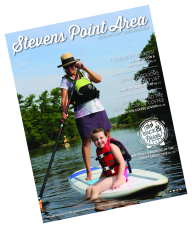 Sign up for information about Stevens Point Area events & festivals, arts & culture, sports & recreation and more. By clicking the box below, you agree to allow us to send you information about the Stevens Point Area. You can unsubscribe at anytime. If you'd like more from Stevens Point Area sent to you, via the mail, please check the box below and include your address. Note: If you selected a brochure be sent, your full address is necessary to complete the request.